Got a question about dentures? Contact us to speak to Ed on 028 2766 3808. Welcome Ed, Our Clinical Dental Technician now in practice. Ed is a Clinical Dental Technician (CDT). A Clinical Dental Technician focuses on the manufacture and fitting of dentures directly to patients. This is a new role in UK dentistry helping to improve the quality of care for denture wearers. Before there were CDT’s a dentist would have taken the patient’s impressions and these would then have been sent out to a dental technician to make the dentures. As the CDT performs both roles, the patient doesn’t have to worry about receiving dentures made by someone who has never seen them. This helps Ed ensure the best fit and appearance of your denture. One of the hardest tasks in Dentistry is to make dentures which fit comfortably, work well and restore the patient’s smile. Some people who need dentures have lost some bone as well as missing teeth. Ed works to help compensate for the sunken profile which can make patients look older. Our patients will benefit from Ed’s years of lab experience. Ed works closely with dentists and can also provide partial dentures. If you require a partial denture then your dentist will draw up a treatment plan with Ed to make sure you get the best possible results. 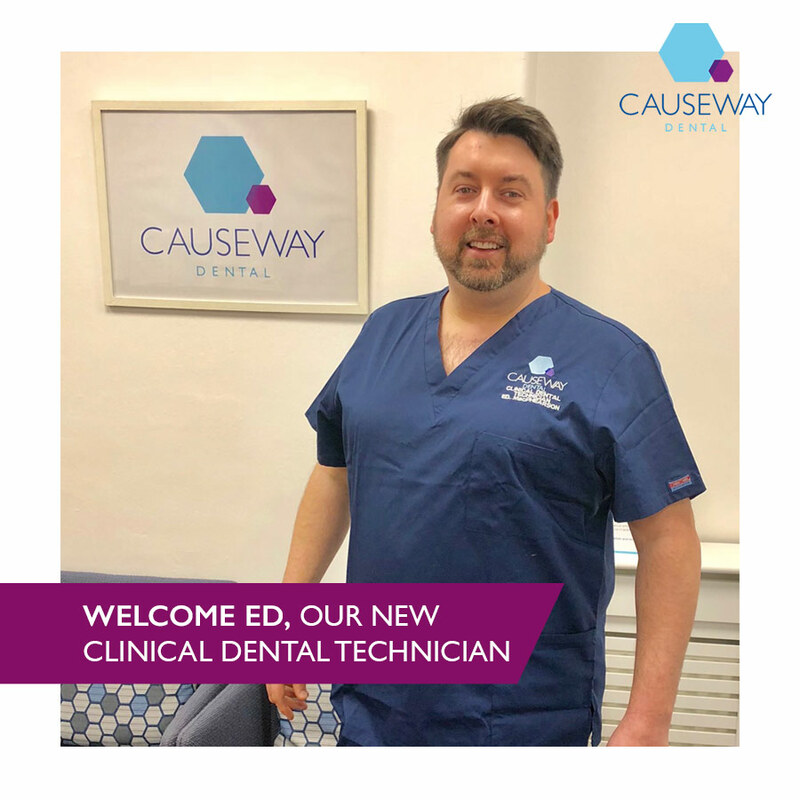 As a Clinical Dental Technician, Ed completes at least 150 hours of Continued Professional Development every five years to make sure he stays up to date and provides the best possible service. A lot of people ask, what is a denture? A denture is a removable replacement for missing teeth and surrounding tissues. Dentures are removable, false teeth that are made of acrylic (plastic), nylon or metal. They fit snugly over the gums to replace missing teeth and eliminate potential problems caused by gaps. Two types of dentures are available - complete and partial dentures. A full denture will be fitted if all your upper or lower teeth have been removed or you're having an old complete denture replaced. The denture will usually be fitted as soon as your teeth are removed, which means you won't be without teeth. The denture will fit snugly over your gums and jawbone. If you have dentures fitted immediately after the removal of several teeth, the gums and bone will alter in shape fairly quickly and the dentures will probably need relining or remaking after a few months. Occasionally, your gums may need to be left to heal and alter in shape for several months before dentures can be fitted. You can either see a Dentist or Ed, our qualified Clinical Dental Technician to have your dentures made and fitted. A partial denture is designed to fill in the gaps left by one or more missing teeth. It's a plastic, nylon or metal plate with a number of false teeth attached to it. It usually clips onto some of your natural teeth via metal clasps, which hold it securely in place in your mouth. It can easily be unclipped and removed. Occasionally, the clips can be made of a tooth- or gum-coloured material, although this type of clip isn't always suitable because it tends to be more brittle than metal. We can measure your mouth and order a partial denture for you, or you can see Ed, who can provide a partial denture for you directly after you have first seen your Dentist for a treatment plan and certificate of oral health. If you would like a chat with a member of our staff about your options give us a call on 028 276 63808. Use the minimum amount necessary to provide the maximum benefit. Apply less than you think you need, and then gradually increase the amount until you feel comfortable. WILL THEY MAKE ME LOOK DIFFERENT? No, if dentures are done correctly then they shouldn't make you look any different. Dentures are made to resemble your natural teeth there should be only a small noticeable change in your appearance. So in some cases it can even improve a persons smile and fill out their facial appearance. Over time, your dentures will need to be relined or re-made due to normal wear or a change in the shape of your mouth. Bone and gum ridges can shrink, causing your jaws to meet differently. Loose dentures can cause health problems, including sores and infections, not to mention discomfort. A loose or ill-fitting denture can also make eating and talking more difficult. It is important to replace worn or poorly fitting dentures before they cause problems. WILL THEY CHANGE HOW I SPEAK? Speaking may seem odd at first. You might feel you are lisping, clicking or even that your voice has gotten louder. There is no need to be embarrassed about speaking; other people are much less aware of the awkwardness than you are. The material dentures are made of conducts sound in the same way the bones in your skull do. In the same way that your voice sounds different when you listen to a recording this is much more noticeable to you than to anyone else. A few days practice should lessen all of these effects. Your tongue has to learn where your new teeth are. If you click, try speaking more slowly. Your muscles have to get used to holding lower dentures in place. If you feel you are lisping speak slowly. Try to bite down & swallow before speaking. This places your dentures in position so you can speak more clearly. If you have never had dentures they may feel a little strange or even slightly loose for several weeks this is just until the muscles of the cheeks and tongue relax and help keep them in place and it is comfortable inserting and removing them. Sometimes minor irritation or soreness can occur and for saliva flow to increase when dentures are first woren, but these problems will go away as the mouth adjusts. CAN YOU WEAR 24 HOURS PER DAY? Ed our denture expert will instruct you as to how long to wear dentures and when to remove them. We have found during the first several days after receiving your denture, you may be asked to wear it all the time, including while you sleep. Although this may be temporarily uncomfortable, it is the quickest way for Ed to identify the areas in which the denture needs adjustment. Then once adjustments are made, you should remove dentures before going to bed. This allows gum tissues to rest and allows normal stimulation and cleansing by the tongue and saliva. The denture can be put back in the mouth in the morning. No. Dental implants can be used to support cemented bridges, eliminating the need for a denture. The cost is usually greater, but the implants and bridges more closely resemble the feel of real teeth. Have a chat with Ed and find out which option best is suited for you. Regular dental check-ups and having your teeth professionally cleaned are vital for keeping your teeth and gums healthy. Most dentists recommend a dental check up at least once a year. Regular visits allow your dentist to check the soft parts of your mouth, including the tongue and cheeks. These examinations are important so the dentist can spot any infections, mouth conditions or even mouth cancer at the earliest stages. Full denture wearers should check with their dentist about how often they should visit. With regular professional care, a positive attitude and persistence, you can become one of the millions of people who wear their dentures with a smile. We offer Nhs and Private options. Find out how our payment options work. You could have this treatment from as little as £99.00 per month. Dentures take up lot of space in your mouth so you are much more likely to feel food remnants collecting underneath them than someone with natural teeth. You should brush your remaining teeth, gums and tongue every morning and evening with fluoride toothpaste. Clean your dentures as often as you would normal teeth. Don’t use hard bristled toothbrush or brush too hard as you can make grooves in the denture. Brush your dentures with toothpaste or soap and water before soaking them to remove food particles. Make sure you brush ALL the surfaces, especially if you are using an adhesive. If you notice a build-up of stains or scale, ask us about getting the denture cleaned. It is important not to use any type of bleaching product to clean your dentures. Do not use boiling/very hot water to soak your dentures as the plastic may warp.